What controller are you using in the Forkenswift now? It's a Club Car golf cart controller: 36/48V 225A Curtis. That Alltrax output looks great! Tie it in to the vehicle speed sensor with some basic programming and you've got the ability to do average and instant energy consumption! You're accident is not cool, could this bring back insurance problems/raises ? Or is the other guy not going to declare to the insurance? Pas de probleme. L'autre gars, c'est mon frere! Minor damage. And the damage to the van is just a scrape in the paint. But it's 12 years old, and coincidentally, my scrape is located just above a much larger dent/scrape that was already there on the van. They're not worried about it - in fact my brother was more concerned about my car. Also, more about the inspection questions. I guess you did not had to argue for the added weight and they didnâ€™t see anything wrong whit your modified brake system ? No - we're still within the GVWR with a 48v pack and 2 adults. As for the brakes, I doubt they would even notice the Metro is wearing larger calipers and discs from a Swift. Sorry to post in this thread, but can you put me in contact with the Rover metro owner in the UK? Im in the UK and looking to a similar problem, would like to talk to him about sourcing materials and insurance over here. A used 36/48v 400A Curtis popped up on eBay this morning for a buy-it-now price of $75. That would have been quite the upgrade from our 225A controller. But it was an "as-is" sale, and the seller said he had no way to test it. Before he could answer a couple of questions I sent to help me decide if I should pull the trigger, someone else snapped it up. Not surprisingly, perhaps, but it's still a $75 gamble ($100 with shipping). But the biggest fish that got away remains the 48-72v promised-to-be-working unit that went for $200 last year. So about every 3-6 months, by my estimate, a deal comes up on eBay that would suit the ForkenSwift. Of course, we can still jury rig a controller bypass circuit to give us higer voltage and current on demand, but a more powerful controller is so much easier - plug ' n' play. The car is coming soon! Are you saying it's a rectangle with those dimensions? Ya, it's a rectangle. Maybe I should wait just in case. What's that smell? Why, it's the stink of money!! Money from my tax return that is in the mail!!! ya! The next available $200 metro that comes along, I'm getting it, assuming it's not a complete piece of crap. Starting last month, there have been about 3 really good metros for $200-$300, and when I would say, "duh, uh, could you hold the car until feb. 15th? I promise I gots da money den." They would reply, "uh, no." I have a 340amp continuous, 200v SCR that I got for $15 on ebay (it used to be in a machine at Los Alamos National laboratories). It had a brief stint on my home-made crappy battery spot welder. That could work instead of buying a $100 contactor, but they fail ON! Someone told me that they need heat sinking, and cause a 1.5v drop, but I've measured 0 ohms when it's "firing", but I don't want to discount the EVDL guys. I think it would be cool to somehow hook the SCR to a timer, so that it somehow becomes a controller, but I would have it be about 40 Hz rather than the usual 15kHz, so that it would make a cool sound that all the kids love these days that is low and rumbly. Last edited by MPaulHolmes; 02-14-2008 at 08:17 PM.. 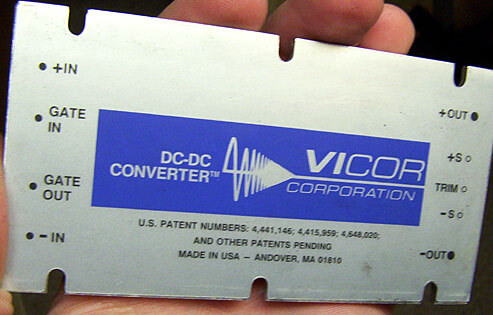 Anybody know anything about DC/DC converters? We picked up a VICOR 48v to 15v for 20 bucks on eBay last fall, but haven't installed it yet. We've just been recharging the aux 12v battery individually. But I completely drained the 12v with the headlights the other night, and I didn't have a patch wire with me to tap the pack and get the lights back on. I ended up driving a few blocks (on deserted streets) with no lights or signals. So... I'm motivated to get the DC-DC hooked up! The Vicor PDF for the 200 series converters doesn't actually list this specific model. I'm not sure what Gate IN/OUT is, but I'm assuming I hook pack +/- to IN +/-. I also assume I can trim the output voltage if I want to, but if I don't can I just hook OUT +/- to the 12v battery? Can I switch the unit and turn it on/off as desired? Where should I fuse it? While I use a different brand of DC/DC converter, you will need two fuses - one for input (48V) and one for output (12V). I run the input and output with a double pole relay with a 12v coil. Both input and output are normally open. When I turn the key, power goes to the relay coil, turning on the converter (48v) and powering the 12v system (and charging the battery). If you leave it hooked up to the 12v battery, it will probably backfeed about 50 milliamps or so, draining your aux battery when you aren't driving the car. Depending on what type of aux battery you have, you will need to match the converter output to about 13.6v (for flooded) or about 13.3v (for sealed) Check manufacturer recommendations for your specific battery. If you have the voltage too low, it won't charge properly, and too high will fry a sealed battery (flooded are more forgiving). What's the current output of the DC/DC converter? Couldn't you prevent back flow with a diode? Adjust your charging voltage at the battery since the diode will have ~0.6v drop. Typically, you can hook some sort of potentiometer up to those "trim" connections. Then you can use it to adjust the voltage up or down. I am currently running the cycle WITHOUT an accessory battery, just to save space and keep things simple. The electrical load is one headlight, taillight, and turn signals - very few watts. It has a "power switch" pin that was marked "Rem" and remotely controls power to the DC/DC converter. I trial-and-errored to fingure out which pin I had to connect that to and then wired up a basic 12v switch on the dashboard to turn the converter on and off. As Tom said, you need to adjust your output to keep you accessory battery happy. I will have to do that if/when I ever add an accessory battery. It would probably be a good safety feature so that I still have horn and brakelights if something ever happens to my main pack. The red arrow on the DC/DC converter is a not to myself for which pins to connect to power up the converter. The left switch turns on the converter. Then I turn on the lights, followed by power to the controller, which is on the right handlebar in place of the original start/kill switch. Then I drive off!